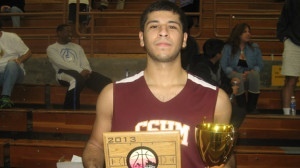 One of top 2014 Student Athletes on the West Coast Joey Covarrubiasof Cantwell Sacred Heart HS in Southern California. Joey has been showing out grabbing major attention from college recruiters and media outlets this High School Season. Mid Major Hoops Report has brought him to our “Players Corner” where we at MMHR are proud to highlight him as one of the most underrecruited prospects in the 2014 Class…. Joey Covarrubias: As a combo guard I am a versatile player on both ends of the court. Joey Covarrubias On one of Dinos Trigonis team. PANGOS/Bellmont Shore. 4. Describe your game for coaches and fans who haven’t seen you play yet? Joey Covarrubias: Old mans game; I don’t look the part but the results DO! A ‘Mark Jackson/Andre Miller’ type. I am a versatile player. I can shoot the 3 ball effectively off the catch or the dribble. I am a wing who gets to the basket as needed. I am at my best running the point in the last few minutes of a game. My coaches and teammates feel at ease when the ball is in my hand during those winding minutes. Very few observers focus on defense but if they do they will see that I can guard at a high level regardless of position. Joey Covarrubias: How cerebral my whole game is on both end’s of the court. Those watching may not see the impact, but those who coach me and those who I play against can feel how I affected the game. Joey Covarrubias: Finishing at the basket. It has come from being more on attack mode. Cantwell has required that from me. Joey Covarrubias: I am currently working on my ballhandling and getting quicker at my 1st step. I still keep it very simple. One or two moves at most. Its not how fast I can get there, but how do i get there. Joey Covarrubias: Cal St LA, and Biola. Joey Covarrubias: No specific one’s at this point. A coach who makes an impression on me will be a coach who want’s me and not one who needs me. Joey Covarrubias: Fresno St, Cal St Long Beach, Cal St.Fullerton, Northridge, UC Riverside, Grand Canyon, Northern Arizona, Biola, Cal St.LA. Joey Covarrubias: No visits yet. Joey Covarrubias: Anywhere that gives me the best opportunity. Joey Covarrubias: I work very hard. I get very little sleep. It is a fulltime occupation with mandatory overtime. Joey Covarrubias: I was month’s old. Joey Covarrubias: My father and my uncle Cezar Guerrero AKA CJ. Joey Covarrubias: Playing in the CIF championship game my sophmore year minus the end result. Joey Covarrubias: Winning a CIF championship and rewarding myself with a scholarship. Joey Covarrubias: Getting a College degree and getting paid for playing the game I LOVE. Joey Covarrubias: My twitter is 0jaycee5. 21. What style of play do you prefer? Joey Covarrubias: Open style type! 22. Who’s a player in college basketball or the NBA that you really respect? 23. Do you prefer Nike, adidas, or Under Armour? MMHR would like to thank the Covarrubias family for making this interview happen. Good luck, Joey on the remainder of your season and your quest for a scholarship.